After the AGM there was an opportunity to travel on the railway. On arrival at Kiddierminster we had time to see LMS Ivatt Class 4 43106 running round it’s train prior to the start of the AGM. 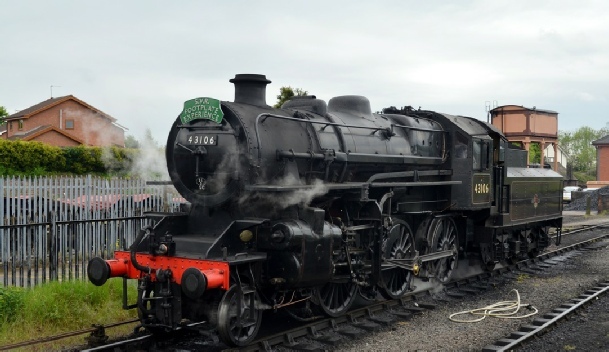 43106 is the is the only surviving example of an LMS Ivatt Class 4 2-6-0 Mogul and was completed by British Railways in the former LNER Darlington works, even though built to a former LMS design. Withdrawn in 1968, 43106 went straight into preservation, travelling light engine direct to the Seven Valley. 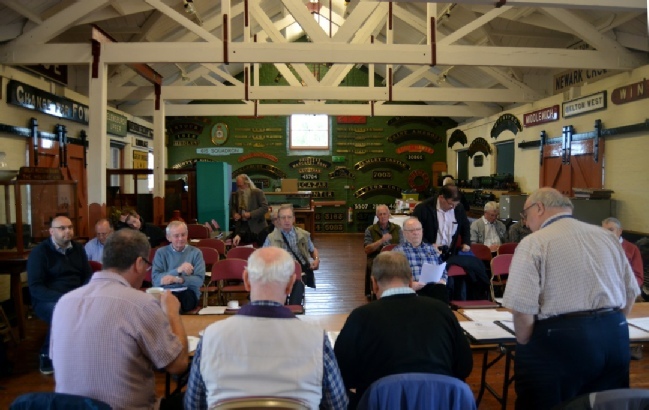 The AGM was held in Kidderminster Railway Museum Royal Star Room. The ‘top table’ of the Council get ready to start proceedings. 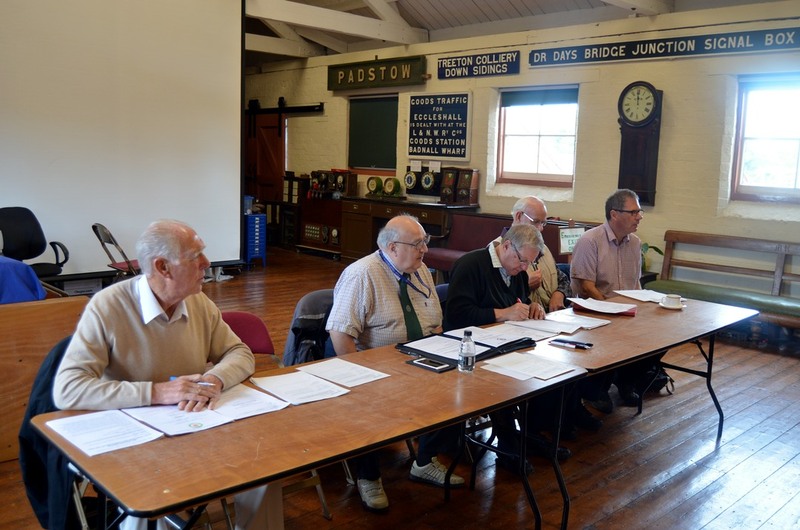 From Left to right: Assistant Secretary, Alan Hughes; Chairman Alan Spencer; Institution Secretary Malcolm Pym; Retiring Treasurer Brian Ashfield and President, John Doyle. Members get ready for the start of the AGM. Note the large collection of locomotive nameplates on the walls. 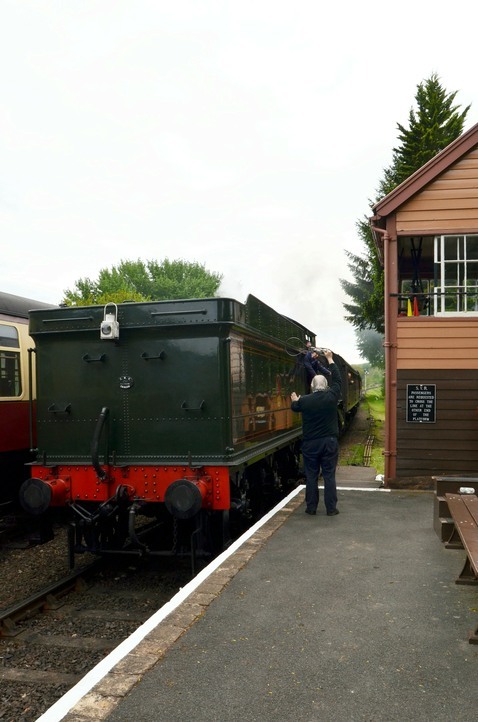 After the AGM, most members caught the 14.00 train from Kidderminster to Bridgenorth. 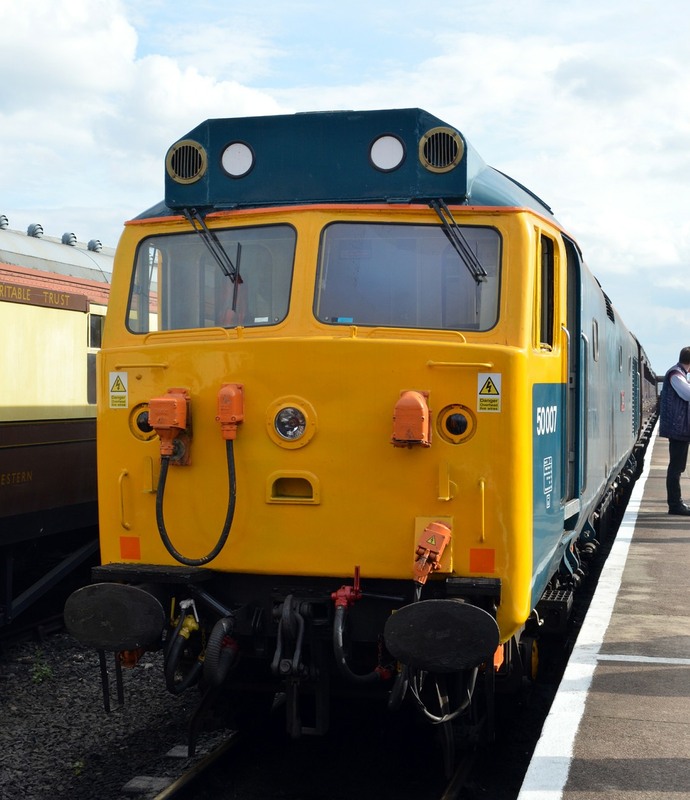 However for those after 50 haulage, there was the opportunity to catch the 13.15 from Kidderminster was worked by 50049 Defiance. The train was tailed by 50007 Hercules, powered-up, but not providing traction. 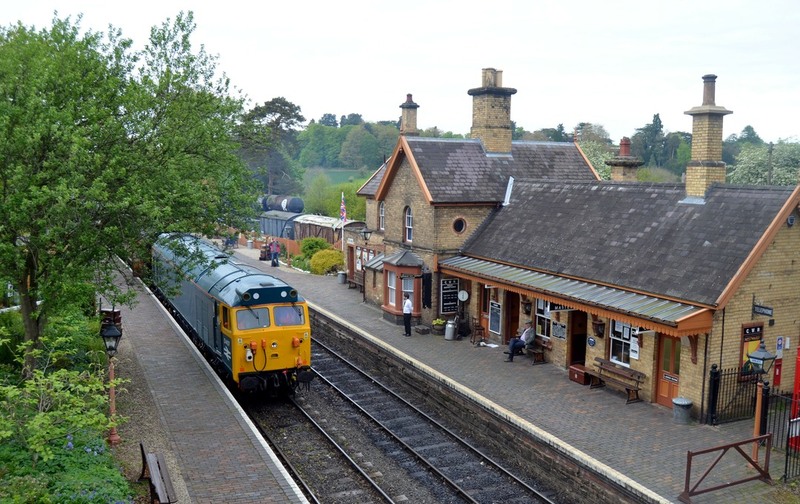 The train was then delayed at Arley due to a lineside fire on the line ahead. 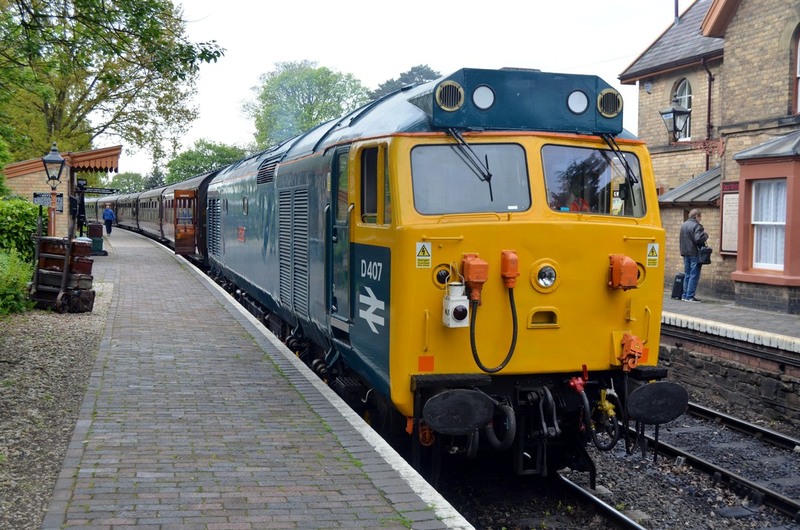 Here 5007 is seen at the rear of its train at the immaculate Arley station, painted in GWR colours. 50007 was repainted from BR ‘large logo’ colours into GWR Brunswick Green and renamed Sir Edward Elgar in Worcester in February 1984 to commemorate fifty years of the composer’s death. 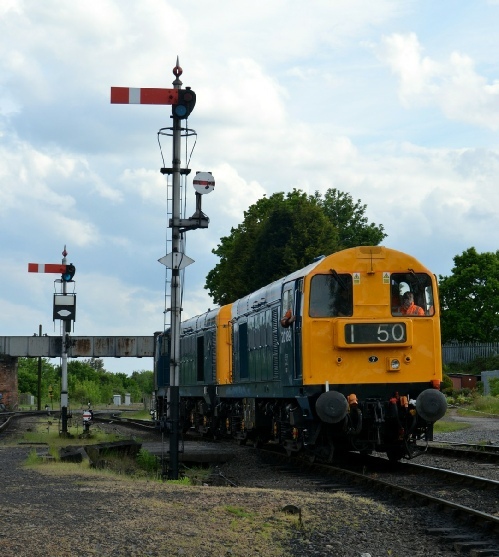 This move was not popular with Class 50 enthusiasts, which resulted in the loco being given the unfortunate nickname of “snot vac” - (vac as in hoover, an earlier nickname for the class). However this livery and name did mean that the loco was considered a celebrity by British Rail which meant she survived until the end of Class 50 operation - unfortunate for popular 50046 Ajax which was switched off to donate its main generator, power unit and bogies to 50007 after its original main generator flashed-over on the 13.15 Waterloo to Exeter on 09/07/1991. Fortunately 5007 has now regained its original ‘warship’ Hercules name. 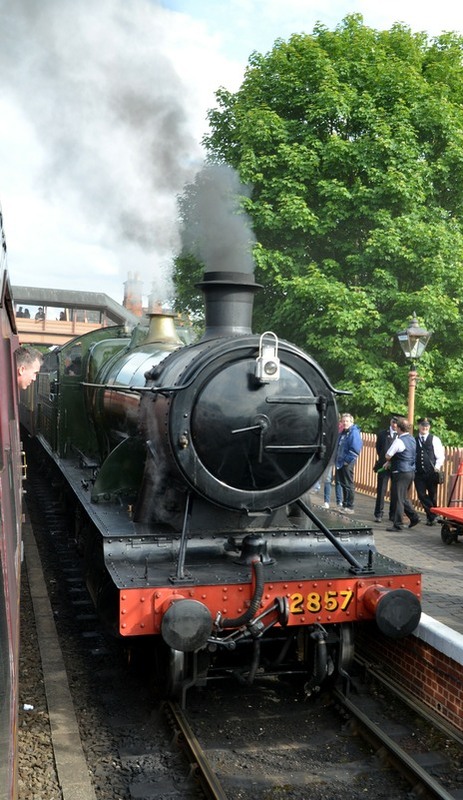 The Severn Valley Railway, as the name implies, closely follows the River Severn for most of the route. 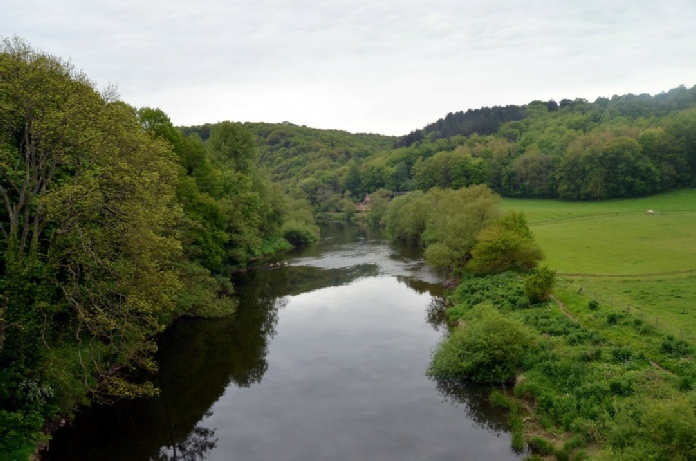 Between Bewdley and Arley the railway crosses the river on the Victoria Bridge - a 200 feet single-span cast iron bridge designed by John Fowler. Seen here is the view looking west from the train on the bridge. 50049 upon arrival at Bridgenorth. 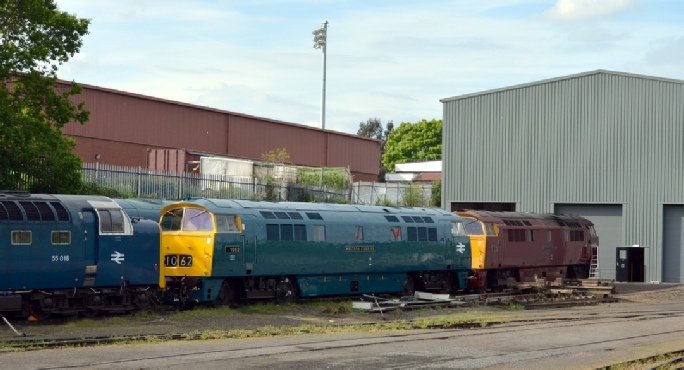 50049 was the last Class 50 constructed, being completed at English Electric Vulcan Foundry in December 1968, originally numbered D449. 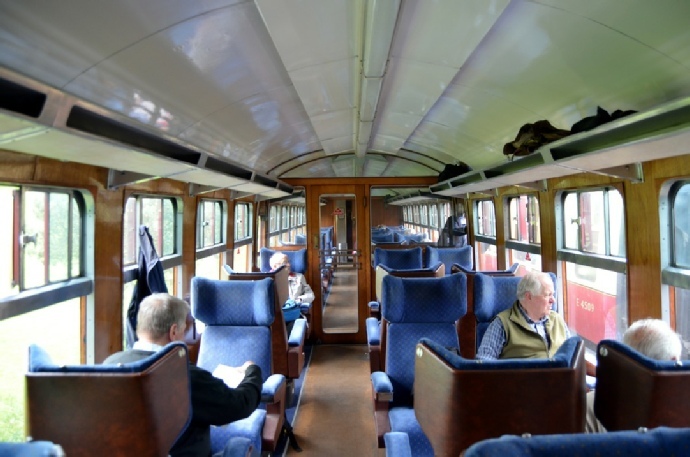 Those members travelling on the 14.00 sat in Doncaster built prototype first class open coach 3083. This coach was one of fourteen trial coaches built by various contractors and BR workshops in 1957 to trial new ideas and fittings for the next generation of coaches whilst using standard MK1 coach bogies, underframes and running gear. 3083 included fluorescent lighting and rotating seating whilst using teak matchboard lining and aluminium fittings in an updated LNER style. The coach was withdrawn by BR in 1972 and preserved by the SVR a year later. The very comfortable seats have been trimmed in moquette reminiscent on the 1957 original. Note the smaller than standard, but numerous, windows. A view of Bridgenorth engine shed. ‘On-shed’ are rebuit Southern Railway Battle of Britain Class 34053 “Sir Keith Park”, 1900-built Port Talbot Railway (later GWR) 0-6-0 saddle tank 813, GWR 0-4-2T Collet-designed 1400 Class 1450 and GWR Collet 4-6-0 Hall Class 4930 Hagley Hall. 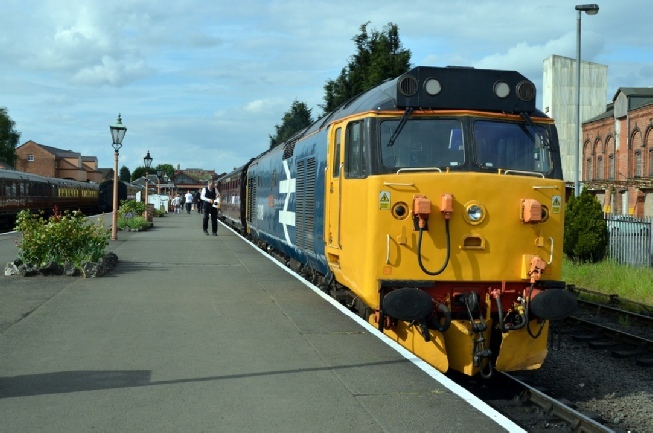 The return journey was on the late running 15.30 from Bridgenorth hauled by 50007 Hercules. The train had to wait at Hampton Loade for the 14.45 from Kidderminster to clear the single line ahead. 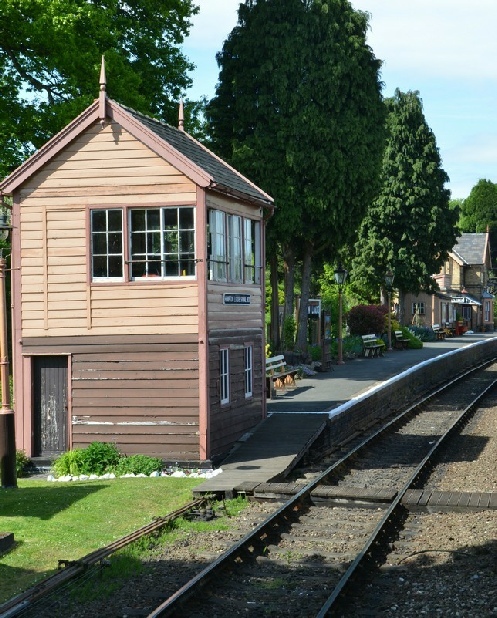 Seen here is the view of the Great Western signal box and down platform at Hampton Loade. GWR Churchward Heavy Good Loco 2857 arrives at Hampton Loade with the 14.45 from Kidderminster. Note something seen from the window of a British train everyday! 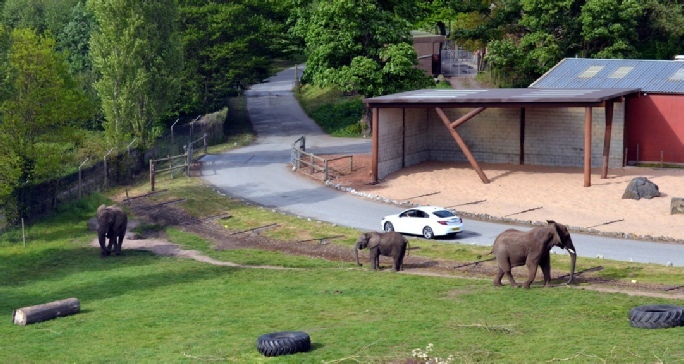 Elephants in West Midlands Safari Park between Bewdley and Kidderminster. Somewhat appropriate to view these strong animals when being hauled by a locomotive called Hercules! 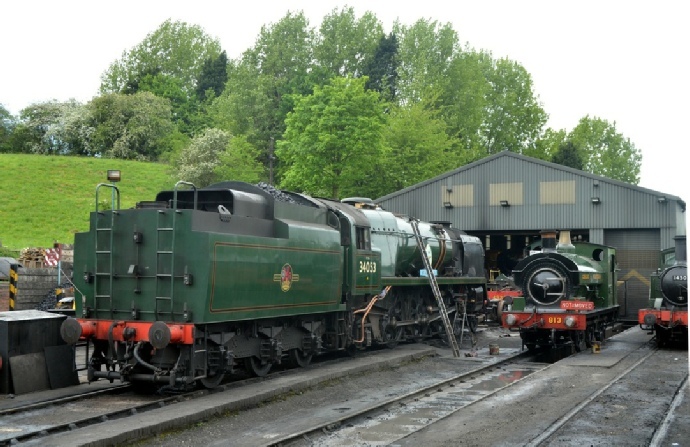 Kidderminster diesel shed. Seen here are resident Westerns D1013 Western Ranger (maroon) and D1062 Western Courier (blue). In front is the ghost of Deltic D9018 Ballymoss, which was scrapped in January 1982. 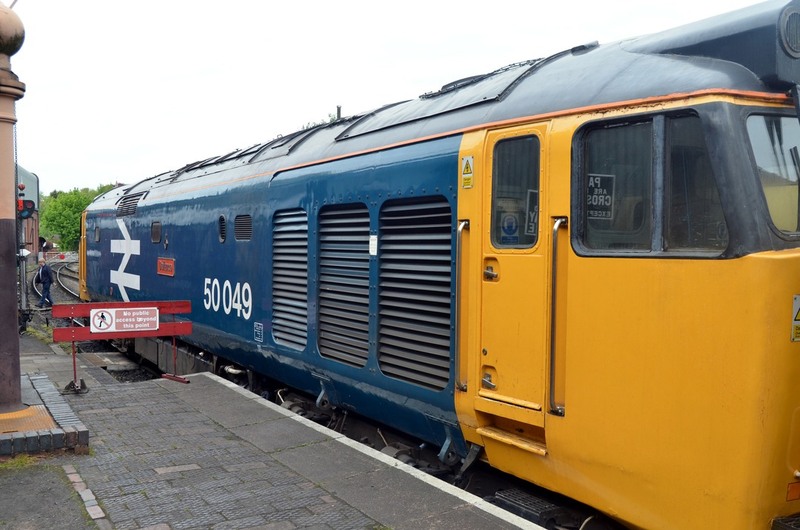 This was actually D9000/55022 Royal Scots Grey in disguise, which had travelled from the North Yorkshire Moors railway, ready for the SVR diesel gala the following weekend. The roof of 45060 can be seen behind. 50007 Hercules upon arrival at Kidderminster. Note this loco has the TOPS number 50007 on one side and the original number D407 on the other - see photo at Arley above. 500049 Defiance at the rear in the popular Laira modified large logo livery, with a more practical black roof rather than light grey which the was originally applied when most of the 50s were refurbished by Doncaster works in the early 1980s. 50049 Defiance nameplate and crest. Whilst the Defiance had been the name of a number of warship from the 16th century, by the 1970s it was the name of the fleet maintenance base at Devonport (Plymouth), with the establishment’s depot ship named HMS Defiance. 50007 Hercules gets uncoupled from its train. When the Class 50s were refurbished by Doncaster works in the 1980s their appearance was changed in a number of ways, including the fitment of the high-intensity headlight on the front, plating of the former glass-fronted headcode box, plating over of the four sandbox fillers on each side, the replacement of the body-side window nearest the main radiator with a grill on each side, the plating over of the roof ‘cut-out’ formally used for the rheostatic breaking on one side and the installation of a small ‘tripod’ cover over a fan outlet on the roof. A number of these alterations can be seen in this view. 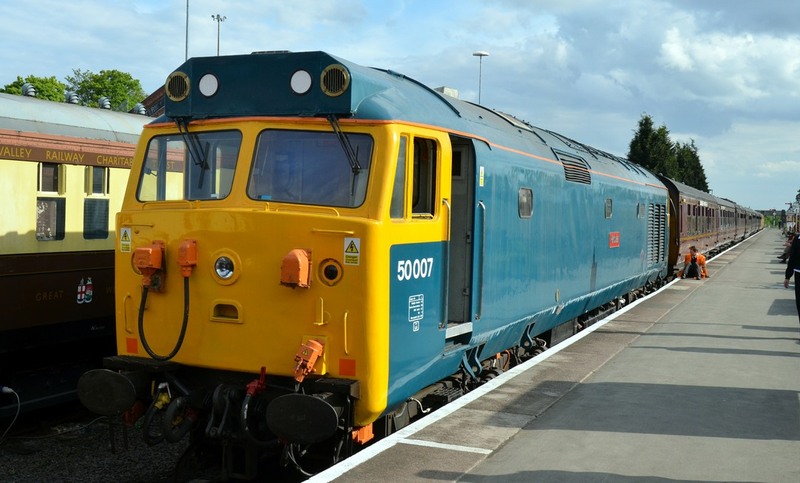 50007 was released from refurbishment on 28/02/1983. At the other end of the train 50049 was uncoupled ready to return to shed. In 1989 50049 was experimentally used as freight locomotive, mainly on Cornish china clay traffic. 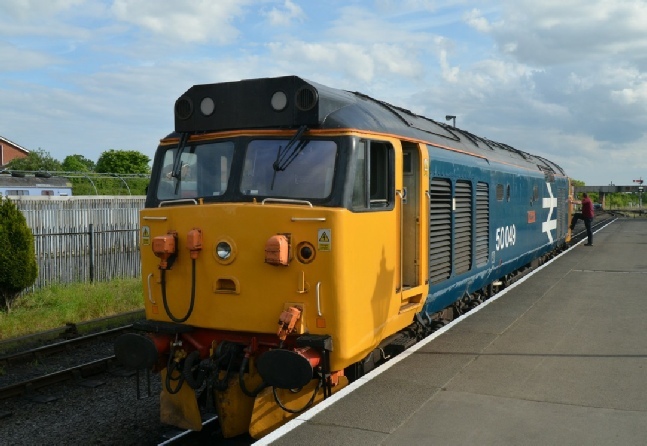 The locomotive was fitted with re-geared bogies and painted two-tone Railfreight grey, retaining its Defiance nameplate, which was given a yellow background colour. 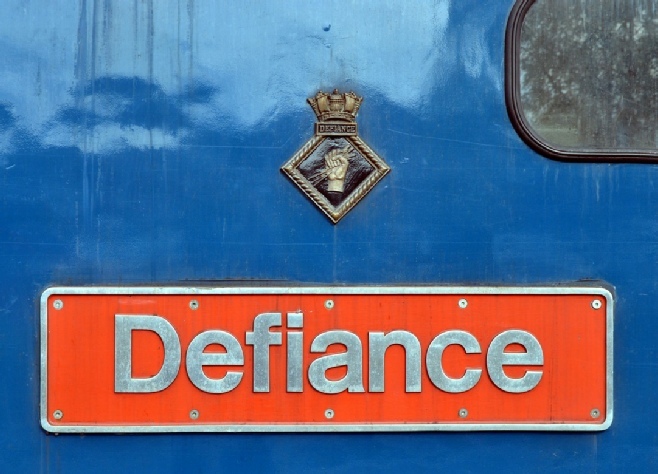 It was not a great success and in 1989 Defiance was brought back into passenger service and painted into Network SouthEast colours. When the locomotives were refurbished, sanders as well as slow speed and traction control equipment were removed to simplify the locomotives to improve reliability. However these features made the locomotives less suited for freight duties - the locomotives originally being intended to be mixed-traffic.